Miso, the protagonist of Microhabitat is someone we all know. Her grey hair which is fairly unsuitable for her age may easily deceive one into thinking that she is someone else. However, she would definitely fit into the mold of a person that we often forget or have lost touch with. From her perspective, it hardly matters how the outside world perceives her or if it hardly knows and remembers her. Her actions, behavior or even the slight details in her dressing style suggest the same. So, when she decides to leave her home when she is unable to pay the rent and spend all of her money on cigarettes or alcohol; it doesn’t seem completely irrational in her world. But it is director Jeon Go-Woon who completely makes us believe in her and her existence. ‘Microhabitat’ is a film about Miso (played by Esom) who seems to have stuck her foot on the wheels of adulthood. She seems to be in her thirties, but she is completely unaware of how her presence affects other people. We are shown that she has been living in the same place for years in the hope of getting back with her long-time boyfriend Han-sol (Ahn Jae-hong). She works as a housekeeper among other things, in order to earn enough money to pay her bills. The real conflict arises when she is told to pay extra rent from the forthcoming month. The rise might have to do with the inflation of cigarette-prices too. While deciding what she could survive upon, she chooses what gives her momentary joy than a shelter over her head. A choice, which seems silly at the time, makes sense as we get to know her character. This is where we get to understand the title- Microhabitat. She leaves her house and practically becomes homeless. The homelessness, even if related to the current state of a particular country; can be found everywhere. That’s why it becomes more relatable. The state of being where one is stuck in a stage and not having a clear state of goals can be found anywhere in the world. Although the film guises to be about a homeless protagonist, it narrates an existential drama rooted in the societal pressures that surround a person. Miso hardly acts mature enough to suit the standards of society. The peace she finds in small luxuries is far superior to long-term investments for her. When she visits her friends after a long time she gets to know that none of them seem to agree to her philosophy of life. While Miso goes out to visit her friends in order to get a place to stay, she gets to know the different realities they have made peace with. She has to adjust herself according to the habitat, as most of her friend’ daily routine is peculiar to her. We get to see reality from her eyes where we find things hysterical or stupid even if that’s how a normal person is supposed to act. We get an insight into Miso when we see her friends – Be it the friend who is constantly forcing her to live with em’ forever or the one who didn’t want her to stay longer as their ideas about the world have shifted massively. The film goes on about how she isn’t able to cope up with the ones of her age as they have drifted apart over the course of time. While often dwelling into the obvious tragic tone, it shares moments of humor that gives it the kind of bittersweet vibe sans a Noah Baumbach film. While playing Miso, Esom perfectly encapsulates her trauma without letting her joy seem too dull or uninspired. Even the moments where she had to be according to what could be considered pathetic, she seems to be completely immersed in the character without passing any judgment as an actor. 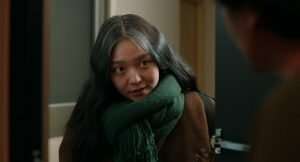 Writer-Director Jeon Go-Woon succeeds in keeping a quiet and steady pace which compliments Miso’s strange perseverance and strength to stand-out even in the deeply melancholic situations. To conclude, Microhabitat is a poignant drama with a lot of heart about a character that is often disregarded. The way it ends might seem a little sappy to many but it feels like the right place to end. It peaks when it highlights her minute existence in the urbanized surrounding she has to succumb. Films are the solace that I often need to be with.